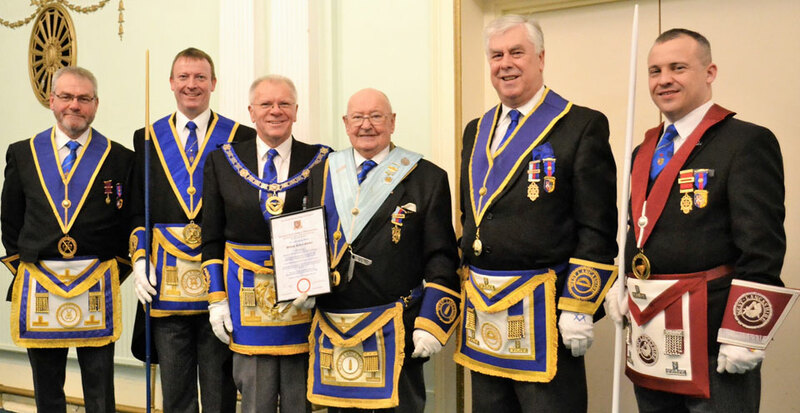 Members and guests of Merchants’ Lodge No 241 gathered in the Adams Suite of Liverpool Masonic Hall to celebrate the 50 years in Freemasonry, achieved by William (Bill) Shuker. The lodge was opened in due form by none other than Bill, who in this celebratory year is the WM of the lodge. Bill was ably assisted by David Pine as senior warden, John Buckingham as junior warden, with Bob Povall acting as inner guard. Once the usual lodge business was completed, it was the cue for the Provincial Deputy Grand Director of Ceremonies Jason Dell to enter and inform the WM that the Assistant Provincial Grand Master Derek Parkinson was in attendance. Derek, accompanied by Liverpool Group Vice-Chairman David Johnson, were led in by deacons Frank Daniels and Peter Lloyd of Merchants Lodge, Provincial Grand Steward Philip Brown and Provincial Assistant Grand Director of Ceremonies Barry Fletcher. Welcoming Derek warmly on behalf of the lodge, Bill proffered the gavel, which was readily accepted and Derek said how nice it was to be with Merchants’ and it was heartening to see so many within the room. He then requested Jason Dell to place Bill Shuker before him for the next part of the proceedings. Derek covered the events, both national and international, that had occurred during Bill’s lifetime since his birth in 1935. The main event for the country in that year, besides Bill, was the introduction of the ‘Penguin’ paperback book, three million being sold within the first 12 months. On the political front, Stanley Baldwin became Prime Minister, until succeeded by Neville Chamberlain in 1937. 1936 had seen the march from Jarrow to London in October and December brought the abdication of King Edward VIII and the subsequent ascension to the throne of King George VI. The decade closed in war with Nazi Germany and its allies. With the end of the war and defeat for Germany and the dropping of the first atomic bomb on Japan, the country moved into the period known as the ‘Cold War’, between the western world and communist Russia. Our Queen, Elizabeth II, was crowned in 1953 and Edmund Hillary and Tenzing Norgay reached the top of Mount Everest. Overshadowed by all these major world events was the early career of a young Billy Shuker in Liverpool. He is first mentioned in an article from the Liverpool Echo on 4 June 1945, appearing before a large audience at the Picton Hall, in a variety concert staged by the Liverpool branch of the League of Firemen, one of a large array of artistes. In 1946, Bill is reported as performing in shows for military personnel, hospitals, the fire service and war workers, being the youngest member in the show at the age of 12. Bill’s early life began in Garston, the fifth child of Alf and Edith, of which only Bill and his sister Joan are alive today. Living in Island Road, he went to South Bank Infant School, then onto Duncomb Road Junior. At age 11, Bill moved up to Heath Road until he left at the age of 15 to work in the local Maypole grocery store. As a young boy he was dragged along to his sister’s dance class, but turned out to be a better dancer than all of them and became a song and dance act, calling himself ‘The Mighty Atom’ and even ‘The Heartthrob’. Always of a busy bee nature, Bill also found time for many other activities and was a keen member of the Boy Scout movement with the 6th Allerton troop. On reaching the age of 17, Bill joined the Royal Air Force, first stationed at West Kirby, before going to serve in Malta. He was taught as a motor mechanic and on leaving the service obtained employment within the Metal Box Company. Not taking to factory life, Bill moved into being a rent collector for Liverpool Corporation, then as a housing liaison officer, making his way up to a senior supervisor. Bill was married to Wendy, who he had met at a friend’s wedding at Garston Church, although their first meeting was many years previous as children. Wendy and Bill went on to have two children, who each had three children, who in turn have produced six great-grandchildren. Unfortunately, when he was 53, Bill suffered a heart attack, which resulted in a quintuple bypass operation by an obviously excellent cardiac surgeon, because 30 years have passed since then. 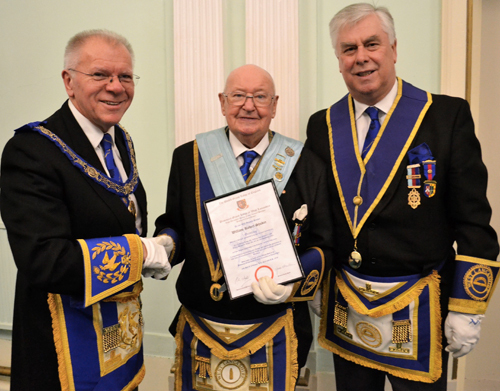 Pictured from left to right, are: Derek Parkinson, Bill with his 50 year certificate and Dave Johnson. Derek moved on to talk of Bill’s Masonic life, which had begun on 25 February 1969, when he was initiated into Anfield Priory Lodge No 2039, proposed by Wendy’s step-father Alfred Hall, seconded by school teacher Jack Bell. Due to the disastrous fire at the Liverpool Masonic Hall at Hope Street the year previous, Anfield Priory had relocated to Bootle Masonic Hall on Balliol Road until 1971 and it was there that Bill was initiated, passed and raised in consecutive months. In 1971 the lodge re-located to Reece’s on Parker Street, until able to move back home to Hope Street in 1975. It was in 1982 that Bill became WM of the lodge and again in 2000. He joined Merchants’ Lodge in 2003 and held the office of both chaplain and almoner for a good number of years. 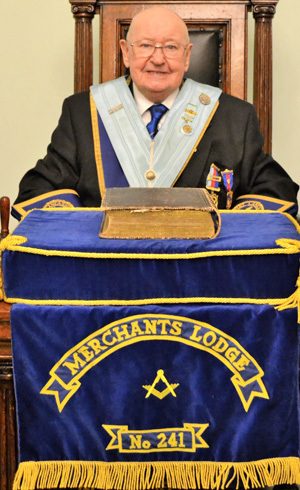 Bill also became the first joining member of Garston Lodge of Installed Masters in 2003, just before the closure of Anfield Priory Lodge, becoming its WM in 20015. Bill was given the provincial appointment of Past Provincial Senior Grand Deacon in 1990, with a promotion in 1997 to Past Provincial Senior Grand Warden. He is also a member of the Royal Arch and held the position of first principal of Royal St George Chapter 4119 in 1987 and presently has the rank of Past Provincial Grand Scribe Nehemiah. Bill has also been a director of Garston Masonic Hall for over 25 years and is very highly thought of by all those associated with that hall. Bill is also a founder member of South Liverpool Rose Croix No 1175. Derek Parkinson then requested Dave Johnson to read the 50-year certificate and then came out of the chair to present it formally to Bill. Addressing Bill, he said that the reason that Bill had got so much out of Freemasonry was because of how much he had given over time, both here at Hope Street and at Garston, in fact everywhere he went, a great example to all. Bill quietly thanked him for such kind words, next presenting three private cheques in favour of Liverpool Masonic Hall, Garston Masonic Hall and the MCF 2021 Festival, a further measure of Bill’s generous nature. At this stage, IPM Ray Fitzsimmons moved into the chair and after a collection for the hall, Derek requested Bill to accompany him in the recession from the room. Pictured from left to right, are: Barry Fletcher, Jason Dell, Derek Parkinson, Bill Shuker, Dave Johnson and Phil Brown.